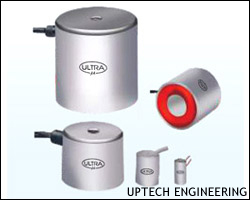 • Used for grinding, light Miliing, Drilling & inspection of round & square Jobs. • Surface A, B, C, D are hardened to hardness 60 ± 2Rc. Two V block per set. • Top, Bottom & V Faces. • Easy ON - OFF facility. • Used for Grinding, Light Milling, Drilling & Inspection of Round & Square Jobs. • The Bigger V angle & bottom holding surface are equipped with hardened strips for wear resistance. 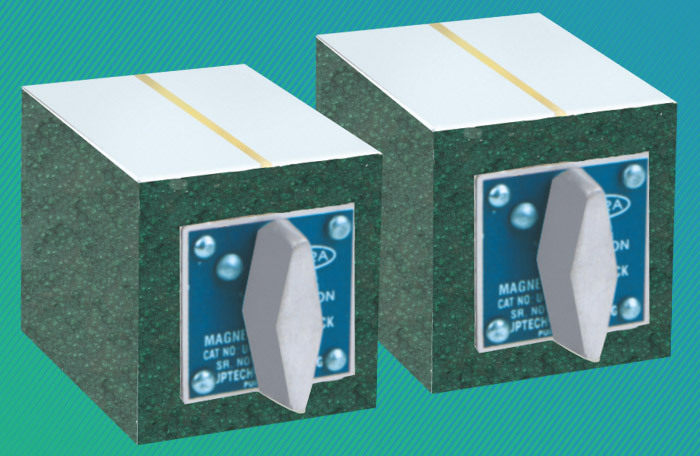 • Uniform and strong magnetic pull to all three magnetic surfaces Top, Bottom & V face. • Hardness of V face is 60±2 Rc. • Easy ON- OFF facility. • 1200 " V " angle also available. • Accuracy for Flatness, Squareness & Parallelism within 0.008mm. •Used for Grinding, Light Milling, Drilling & Inspection of Round & Square Jobs. • Supplied in perfect matched pair. • Holds & Clamps the heavy jobs rigidly. • Tenon slot (16 x 3) at bottom can be used for clamping on machine bed. • Entire top of V is accessible due to unique design. • Accuracy as per IS - 2949 - 1974. • End face grinding, square with sides can be possible. • Two 900 "V" angle for different capacities. • Special sizes can also be manufactured. • Also available to suite your specification. • Accuracy as per IS - 4960 - 1968. • Accuracy for Flatness, Squareness and Parallelism within 0.010mm. • Can be used on its base, the ends & on either side. face plate or on magnetic chuck. • A clamp with cap & adjustable screws prevents tilting of block. • A clearance hole at centre for drilling or removing of dowel pins. handy means for holding shouldered studs round pins etc. 48 square x 90 L.
• Accuracy for Flatness, Squareness and Parallelism within 0.008mm. • It can be used on the base, ends & sides. • Hardness 60±2 Rc & supply in perfect matched pair. • Clamps has tapping holes at 45° & 90° for clamping the square & round jobs. • Stepped groove design permits clamping of small or large jobs. • Used for checking heavy and odd shaped round jobs. • Included angle of rollers is 90º. • Standard bearings are used which are replaceable. • Jobs don't get damaged due to bearing on top. • Special sizes suitable for different diameter manufactured on request. • Used for checking of heavy round & cylindrical jobs. • Supplied in perfectly matched pair having accuracy 0.001mm. • Ball wearing is even, so accuracy doesn't get affected. • Hardness 60±3 Rc & supplied in perfect matched pair. • Sturdy clamps for better clamping of jobs. • End face grinding, right angle with sides is possible. • Suitable for checking of lobbing. • Used for lifting holding & locating of ferrous parts. 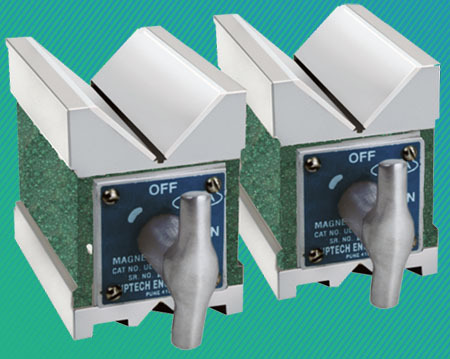 • Compact deign with very strong magnetic pull. • Tapped hole on rear of magnetic face for lifting arrangement. • Compact design with strong magnetic pull. • The Jack-off screw also serves as a handle. • Eye bolt for lifting. 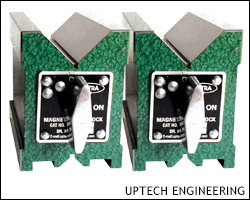 Used in automated manufacturing lines as the magnetic force can be turned on & off or increased or decreased by remote operation via a rectifier or PLC. • Usable for continuous operation. • Quick Attach & Detach enables speedy automation. • Holding Hands of Industrial robots. • In Machine shop, Press Shop, Assembly Line Material Feed.